As you know, I live near Washington D.C. which is full of history! 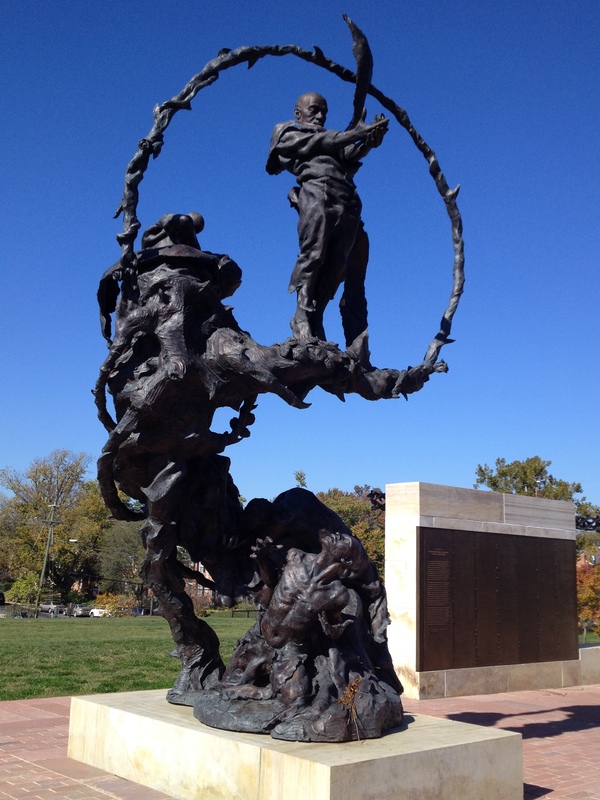 I recently discovered a historic site in my local area that I think is worth a post, the Contrabands and Freedman Cemetery Memorial in Alexandria, VA.
During the Civil War, there were many slaves that fled to Alexandria for freedom and a better way of life. There were so many freedmen (called contrabands) moving to this area because of the Union occupation, that it created a refugee crisis. Many arrived destitute, in ill-health, and hungry. Initially, the government placed the contraband in barracks, but disease ran rampant and many died. In 1864, after hundreds had perished, the Superintendent of Contrabands ordered that a property on the southern edge of town, across from the Catholic cemetery, be confiscated for use as a cemetery. In 1864, the first burials on the site. In 1894, the Washington Post reported that graves were washing out of the cemetery. In 1917, the cemetery was turned over to the Catholic Diocese of Richmond, VA. In 1947, the property was zoned for commercial use. In 1955, a gas station then an office building were erected on top of the cemetery. The plans for rebuilding the Woodrow Wilson bridge, along the southern edge, focused attention on this forgotten cemetery. In 1996, Archaeologists used ground penetrating radar to confirm the presence of graves, ultimately totaling about 1800! 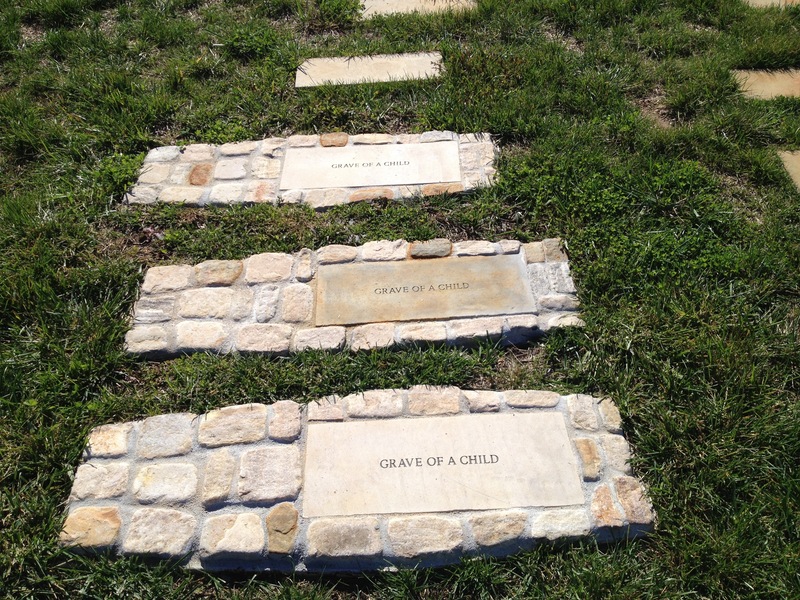 In 1997, the Friends of the Freedmen Cemetery was formed to advocate for preservation of this historic site. Over the years, the cemetery was restored as much as possible. 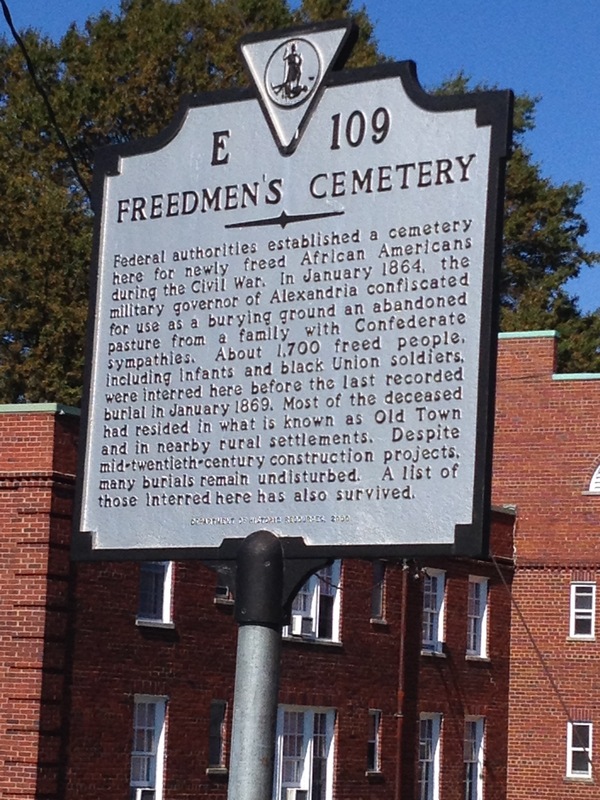 In 2000, the Friends of the Freedmen Cemetery obtained a state highway marker, a rededication on 7 May 2007, and a memorial established then dedicated on 6 September 2014. 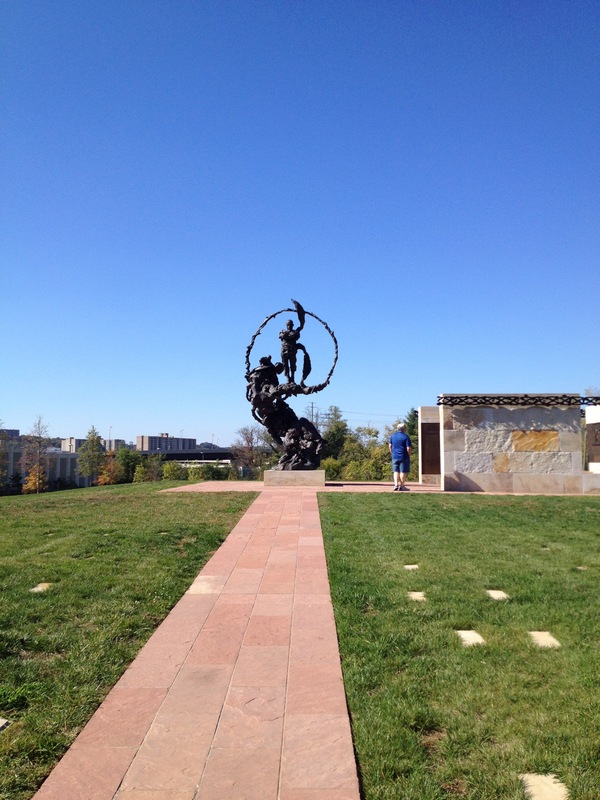 Following are pictures of the site. In the entrance picture, you can see the memorial sculpture in the background, and to the right a listing of the names of those buried and other dedications. Sculpture: The Path of Thorns and Roses, by Mario Chiodo. 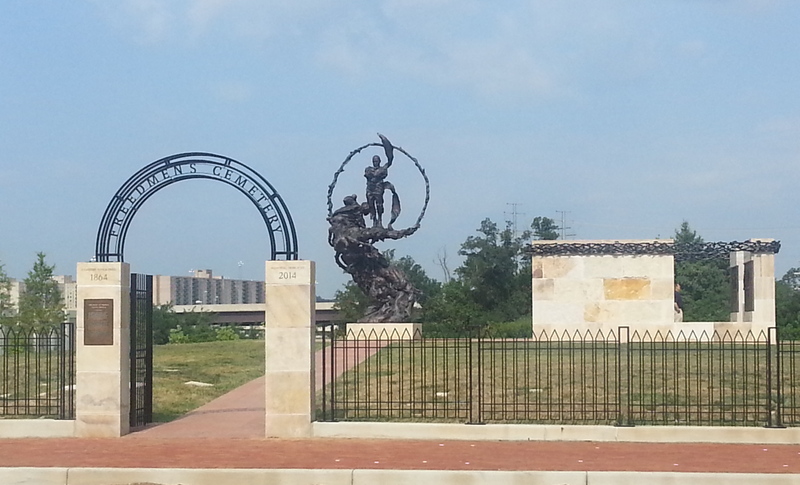 The sculpture captures what the artist envisioned the emotions of the Contrabands and Freedmen would have been at various stages of their Journey. Known location of a child’s grave – name of child is unknown. There are many stones in the cemetery marking known locations of graves. 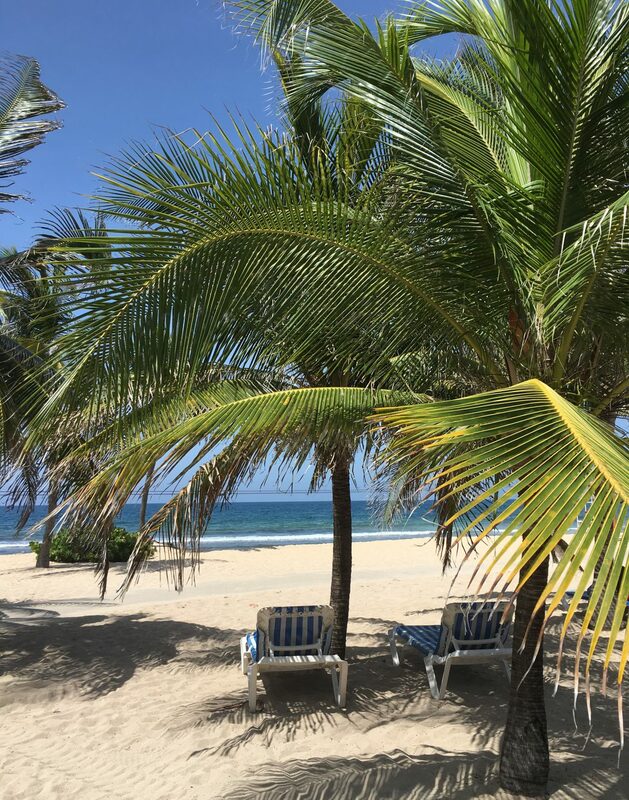 This experience left me humbled. I can’t imagine what it must have been like more than 150 years ago when it all started, and throughout the years as history faded. It took too long to protect this cemetery; however, I am thankful for the efforts of all involved in the restoration, allowing our ancestors to truly rest in peace!